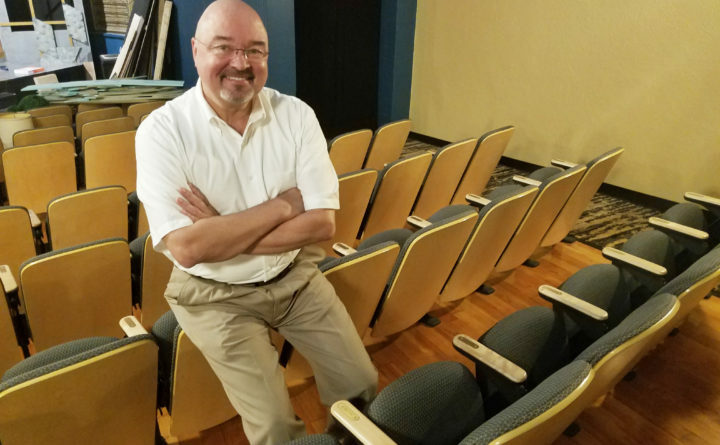 John Hedges, executive director of the Penobscot Theatre Company, resigned after six months on the job. The executive director of Penobscot Theatre Company resigned suddenly Friday after less than six months on the job. John Hedges, 61, began working at the theater, based in the Bangor Opera House, on May 14. He replaced former Executive Director Mary Budd. While Budd is not returning to her old job, she “will help out behind the scenes,” on an interim basis, according Elizabeth Sutherland of Sutherland Weston, the theater’s marketing firm. In addition, Hedges, who had a supporting role in the production “Wait Until Dark,” has been replaced by Bangor actors Ron Lisnet and Allen Adams for the final weekend of performances. Hedges did not immediately respond to a request for comment. Hedges is expected to return to his family in Pennsylvania, Elizabeth Sutherland, a partner at Sutherland Weston, said Friday on behalf of PTC. Prior to coming to Maine, his most recent job was as managing director of the Civic Theatre in Allentown, Pennsylvania. Prior to that, Hedges was executive director of the Weathervane Playhouse in Akron, Ohio. Sutherland described Hedge’s departure as “amicable.” She also said that his departure would not affect the season as announced earlier this year. The theater’s board of directors has not yet decided how it will proceed in searching for a new executive director, she said. PTC did not issue a press release about Hedges’ departure or post information about the casting change on its website. Correction: Due to misinformation provided by Sutherland, the story originally stated that Mary Budd would return to her former position as executive director. She will not.